The surgical specialty we provide is a rare sub-specialty which plays a vital role within the Health Service of the Kingdom of Bahrain. It is known as Oral and Maxillofacial Surgery (OMFS), which is unique in requiring a dual/double qualification in both medicine (MBChB) and dentistry (BDS). OMFS is a recognized international specialty which within Europe and North America is defined under the medical/surgical directives. The British Association of Oral and Maxillofacial Surgeons has produced specialty specific criteria, standards and evidence for the practice of OMF surgery in the UK where a dual/double qualification is mandatory. 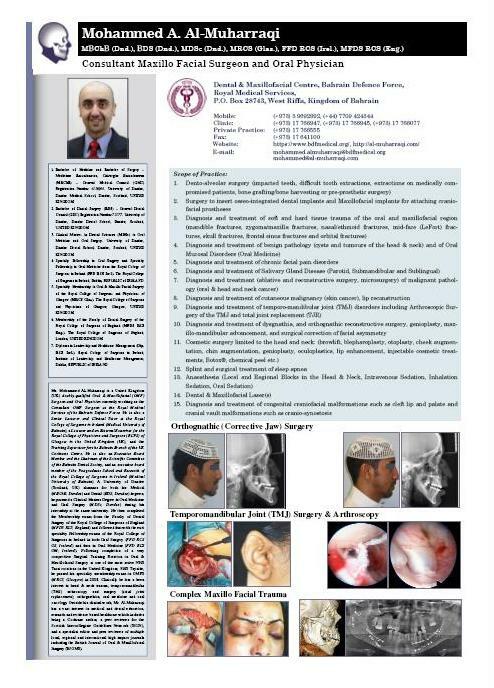 The Royal Medical Services of the Bahrain Defence Force is the only provider of a fully comprehensive Oral and Maxillofacial Surgery Service in the Kingdom of Bahrain of a doubly/dual qualified Maxillofacial Surgeon and it is proud to provide the highest calibre of care locally and regionally.